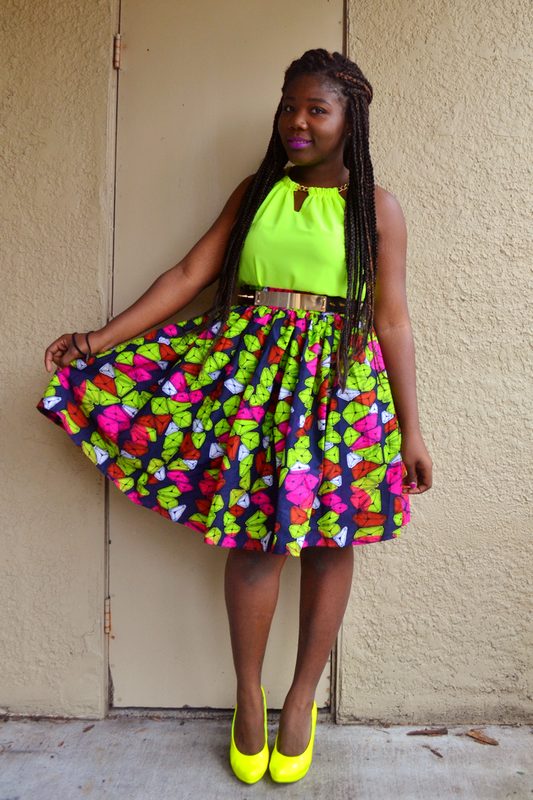 Back to the look, this month's challenge was Ankara and before I start, lemme just tell you a little story. 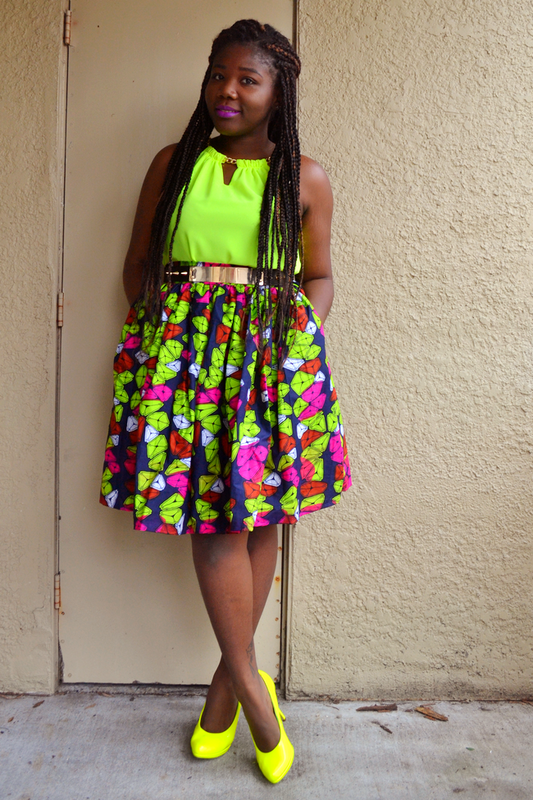 Raliat from The Fashion Fanatic had a giveaway and the price was a DIY skirt by her. I was SO ecstatic about it because if you don't follow her (which I think you should because she's awesome) she has the most amazing ankara pieces and she does sew them herself!! I always love her outfit, because they're classy and I like her style a lot, so I was really hoping to win, and I did! She made this stunning skirt for me, and I knew this is what I was going to wear for the challenge. I like that it is so colorful, and when I saw it I immediately thought of pairing it with neon items! I hope you like the result as much as I do, and please check Raliat's blog as well if you have a chance, you won't regret it! Retour a la tenue, le challenge de ce mois c'etait Ankara (ou le pagne comme on dit chez moi), mais avant que je commence, laissez moi vous raconter une petite histoire. Raliat de The Fashion Fanatic a eu un concours et le prix c'etait une jupe en pagne cousue par elle. J'etais tellement excitee parce que pour celles qui ne la suivent pas (et franchement je pense que vous devriez le faire parce qu'elle est geniale) elle a des tenues en pagne tellement magnifiques et elle les fait elle meme! J'adore ses tenues, parce qu'elles sont chic et j'aime beaucoup son style, et donc j'esperais vraiment gagner, et ce fut le cas! Elle a fait cette magnifique jupe pour moi, et j'ai tout de suite su que c'est ce que j'allais porter pour le challenge. J'adore le fait qu'elle soit super coloree, et quand je l'ai vu j'ai tout de suite pense a la porter avec du flashy! 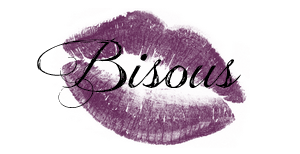 J'espere que vous aimez le resultat autant que moi, et s'il vous plait allez faire un tour sur le blog de Raliat si vous en avez l'occasion, vous ne le regretterez pas! Love the color coordination Diane! 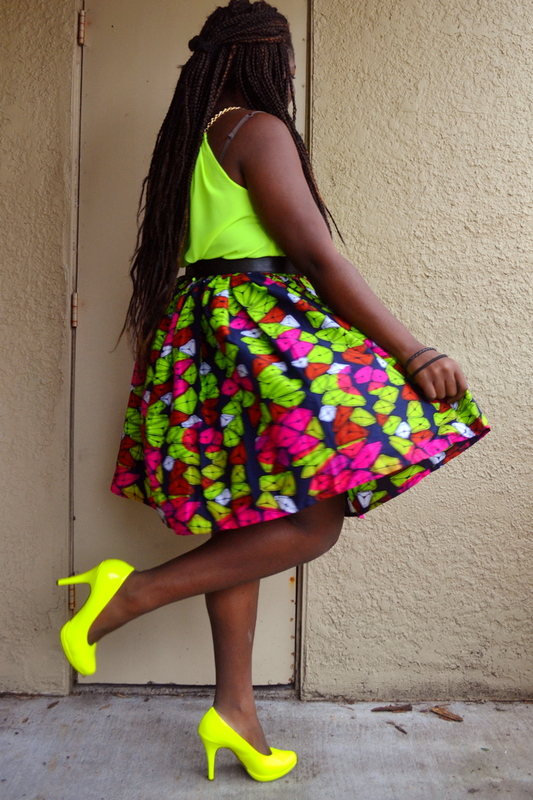 You definitely did the skirt justice! 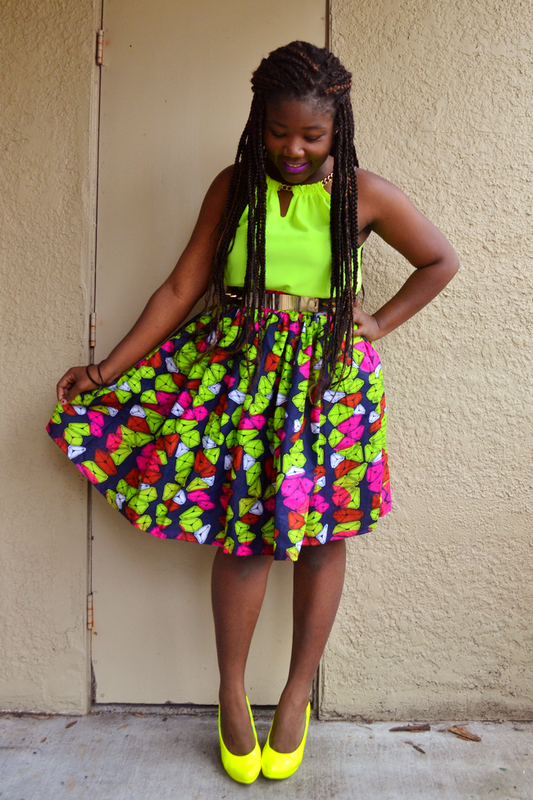 Ohh I totally forgot about this, I saw the email and was going to reply the next hour lol... guess that hour turned into completely forgetting anyway I love this outfit, so bright and colourful which is exactly what our traditional prints are all about. Haha it's okay :p Thank you hun! Raliat did a great job on the skirt. 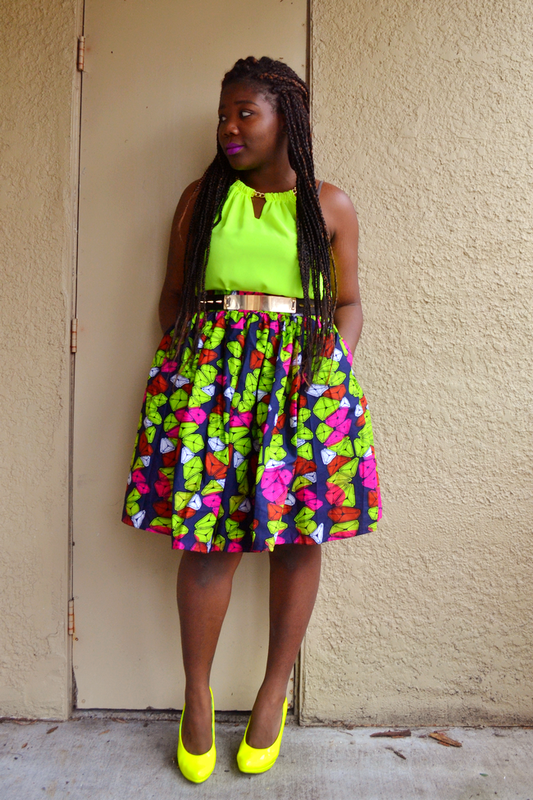 I love how you've styled the skirt with all the complementary colours.